"those with an Internet presence, and those with no business at all." To provide absolutely the very best information technology services to our client base. 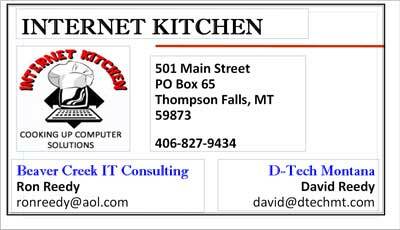 We are two businesses in one room (Internet Kitchen and D-Tech Montana): We offer PC Repair & Service, Website Design & Management, and Technical Assistance. Our primary focus is on Sanders County businesses and cottage industries requiring web presence. ▪ Computer services and repairs: $125 plus cost of parts. ▪ Website design: $1000 for first three landing pages. Additional pages $200 each depending on complexity. 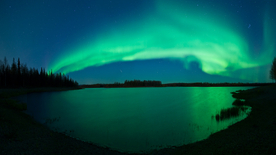 Includes design, development, photo editing, publishing, and SEO . Presenting Sanders County, Montana to the World. Our goal is to share our beautiful county with visitors and to grow businesses through use of the internet. Belknap, Dixon, Hot Springs, Heron, Noxon, Paradise, Plains, Thompson Falls, Trout Creek, (and parts beyond) Montana.